(Buying a ) Home for the Holidays? > (Buying a ) Home for the Holidays? House hunting isn't typically associated with the holiday season, but if you're in the market to buy a home there's no need to give up the hunt just because it's the off-season. In fact, there are those who would argue that house hunting in the off-season offers buyers unique opportunities that don't exist during the traditional home buying season. The holidays, shorter days, less free time and the weather; all play a part in discouraging house hunters from getting out there and looking. That's good news for serious shoppers! You'll have less competition (perhaps giving you more time to make decisions) and your chances of having a winning bid are better, if you find a house you can't live without. Home sales usually chill in the winter and sellers who are not in a rush to move often wait for the home buying season to heat up in the spring. 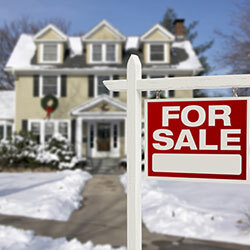 As a result, in the winter you'll typically have less homes to choose from when house hunting. Less inventory though, doesn't mean there aren't great homes on the market. Fewer buyers plus fewer sellers should mean that people in the real estate business are less busy this time of year. Whether it's your real estate agent, mortgage broker, home inspector or mover; chances are you'll enjoy more one-on-one time making the whole process that much better and less stressful. It's believed that homeowners looking to sell in the off-season are often motivated; they need to sell sooner rather than later, otherwise they'd wait until the house hunting high season. That's not to say that there are bargains to be had, but it could mean that the seller may be flexible. What's beneath all that snow? Snow will make it more difficult to easily identify red flags that might otherwise have you drive away before even getting out of the car in other seasons. It will be harder to see the condition of the roof, exterior foundation, landscaping and fencing. Challenges like these can be overcome with photos of the home taken earlier in the year, the background your real estate agent can get on the house, and of course a home inspection. There's no better time, than in in the winter, to see and feel how the home stands up to some of the harshest weather elements. Does the home feel warm without the thermostat being set on high? Are the windows drafty or frosted? Is the temperature consistent throughout the house, or are there hot and cold spots? It's safe to say that for five months a year, your home is subject to winter-like conditions and knowing how it responds is a benefit you just don't get at any other time of the year. While house hunting in the off-season is less common, there's no reason to avoid it just because it's cold outside. If you're ready to house hunt, put on your jacket and warm up the car, because you never know, your dream home may not be on the market come spring. Found a home you love? Compare home insurance rates to make sure you get the best price for the coverage you need. And, don't forget your auto insurance too. Where you live factors into what you pay, and chances are your premiums will change when you move.